Spring Has Arrived on Ivalde! Temperance Moonites already wrote about the changes Neferia Abel is going through and showed some of her new spring collection. It made me anxious, I know Neferia as a lady who always has idea’s and is willing to try new things, so I visited the official opening of her new store and launch of her new brand, L’Abel to see for myself. I love her new modern style, the designs are more trendy than her brand Ivalde was, you can still see some inspiration from the early days. Which makes her designs standing out instead of being just a go with the fashion flow. Neferia surprised me with a nice present, a start for my spring wardrobe. I show you here the grey outfits, because they are my personal favorit. But don’t worry, if you like more colorful outfits, you absolutly will find them also at L’Abel! Neferia, thanks for the sweet gift and good luck with your personal spring, a new beginning. The place looks great and I can see you put many hours of work in it, all fits to make the trendy, modern, stylish look complete. Complements! Go take a look at L’Abel now and experience the spring! And you like presents too? You can find 2 special opening gifts from Neferia in the L’Abel store. Monday 26 January, the real life merged with virtual life in the Beurs van Berlage. After months of preparation it was finally going to happen, the EFA-AIFW2009 show. The Beurs van Berlage was filled with guests, even people were waiting outside looking for a chance to get in and join the show too. After the shows of Eleonore de Ruuk and Melanie Brown, the simultaneous RL-SL show started. DJ Damien.S was tuning and on a big screen you could see the show in Second Life as the guests in Second Life could see the show in Amsterdam. Unfortunate, the camera did not work with the PC, but with the web-cam the atmosphere could be felt and a glimp of the show could be seen in the Beurs van Berlage at Ischia. It was really special to see the both shows at the same time, each with it’s own possibilities. The show in Amsterdam with the speed of the models and the show in Secondlife with the luxery touches. But one thing for sure, both shows had the same character, same feeling, same enthusiastic public and breathing the same atmosphere. Although the EFA-AIFW2009 was maybe not perfect at each detail, all participants can be satisfied and proud on the result. 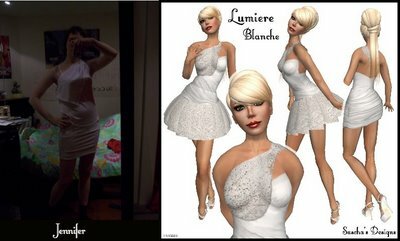 Another step forward has been taken to merge the real life fashion world with the virtual fashion world. I want to give a big applause to Sysy Chapman, Neferia Abel, Sascha Frangilli, Digit Darkes and Zaara Kohime. This designer team did a fantastic job by reproducing the RL-designs in Second Life for the EFA-AIFW2009 show. The challenge was big. 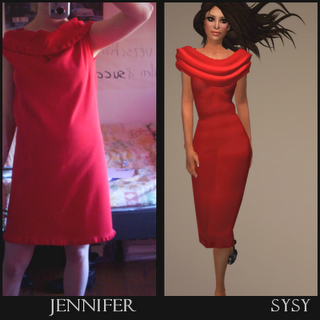 They had to work with working pictures of the RL designer, Jennifer Delano. There was no possibility to see how these designs move, feel, look and fit on a model. And the pictures were not of a very brilliant quality. Also the style of the designs was complete different that they were used to normally. So a complete other way of working, thinking and improvisation was required. You could see the results during the EFA-AIFW2009 show. But also these outfits are now for sale in the shops of the designers. Also you can read at their blogs how they experienced the challenge. For me it was nice to see how everybody coped with this challenge. And great I had the change to have a little view in their kitchen, explaining me what was possible and what difficulties SL can give you when designing clothes. Certainly I will look different now at the designs I can find in SL. What also is nice, that you still can recognise the style of each designer in the reproduced outfits. Sysy, Neferia, Sascha, Digit and Zaara, I want to thank you all for this experience, it was great working with you and nice to know you all a little bit more now! Keep up the good work you all deliver.